Is Nessie a Giant Eel? As part of our continuing "What is the Loch Ness Monster?" series, we come to the idea that Nessie is some kind of giant eel. Now when biologist and Nessie hunter Roy Mackal wrote "The Monsters of Loch Ness" in 1976, he produced a table of thirty two Loch Ness Monster features and ranked six varieties of possible animals against them in a check list fashion. When the tests were added up, it was found that a variety of eel which he called the "thick bodied eel" came second in the rankings of animals. Now this theory certainly ticks a lot of boxes but clearly eels as we commonly understand them cannot fulfill the role of the Loch Ness Monster and even a modified "Nessieel" has issues. The largest known eels are the moray eels (pictured above) which have been known to reach up to 4 metres (nearly 12 feet) in length whereas a typical Nessie sighting suggests a creature up to 10 metres (about 30 feet) in length. The girth of eels versus nessies is also problematic as eels tend to be serpentine in appearance whereas Nessie has a bulky middle portion. Nevertheless, some form of giant eel would stand well against competing theories and would not tend towards the ridiculous as the various features of the Loch Ness Monster are reconciled with what is possible in the animal world. First, by way of background, it is well known that Loch Ness is teeming with eels. No one knows accurately how many eels inhabit the loch because of their behaviour. This is because eels are classed as benthic or "bottom feeders" in that they tend to live on or close to the surface of a sea or lake bottom. Therefore, sonar devices which can be adept at picking up fish in open water cannot easily pick up eels which stay close to the sloping sides of Loch Ness. What seems apparent however is that there are more eels in Loch Ness than all the other fish combined. Renowned monster hunter Tim Dinsdale suggested the population was in the millions but so far all photographs obtained of eels on the sediment floor of the loch showed only normal sized specimens. The question for this post is whether something larger relies on this population for a good part of its diet or perhaps even sprung from them? Inverness Advertiser, 11th November 1851: An enormous eel of 7 feet length, 3 feet 4 inches in girth and 70 lbs in weight was found on the beach of Newton in Aird. Inverness Journal, 29th January 1813: An eel of 5ft 9in was caught at the pier of Clachnaharry. Two eels of similar dimensions had also been caught in the Medway River. So large eels have been caught in this region but obviously not as big as required for Nessie. Stories such as the giant eel-like creature found in the Corpach lock at the other end of the Caledonian Canal in 1900 and various other apocryphal tales are tantalising but do not really progress us in the hunt for giant eels. But what would be the pluses of the giant eel interpretation (assuming a thick bodied variety)? This would account for the scarcity of sightings over the years. An eel is not predisposed to regularly venture to the surface of the loch. Again, this would explain why sonar contacts, though they exist, are not numerous. Our giant eel is a bottom dweller by nature. Not being a warm blooded creature, the energy requirements of an eel are smaller than a mammal and hence suits it more to a smaller body of water like Loch Ness. Also, eels tend to be quite varied in their diet and are opportunistic feeders in that they tend to wait for the food to come to them hence requiring less energy hunting on the move. Eels tend to have an extended dorsal fin running along their back which could give the impression of humps at the surface depending on how the fin folded along its back. It is even possible though not certain that a pliable dorsal fin could account for reports where the number of humps are seen to change. The whole back of this thick bodied variety of eel surfacing could also suffice as a single hump (though it may require some contortions on the part of the entire body invisible to the witness). Eels have the ability to travel short distances out of the water which is linked to their migratory behaviour. This could account for some claims to have seen Nessie on the land (though not all claimed sightings look particularly eel-like). A useful feature if one goes for the single Nessie theory or minimising population numbers. It is claimed that one eel in Sweden has been alive for over 150 years since it was dropped into a well in 1859 by a kid called Samuel Nilsson in Brantevik. On the downside, practically all Loch Ness authors rejected the idea of Nessie being an eel. The idea was first addressed by Rupert T. Gould in his 1934 book "The Loch Ness Monster" but was dismissed by him on the grounds that it could not explain the upturned boat effect of many single hump sightings and the long arched neck. Constance Whyte briefly considered it in her book but again rejected the idea (though she mentions that Maurice Burton in his earlier days was favourable to it). It is a wonder and mystery of the natural world how eels on their 10th year or older leave their European waters to swim the thousands of miles to the Sargasso Sea near the Bahamas where they breed and then die. It is a mystery because no one seems to have actually seen the eels breed. However, if the Loch Ness Monster is an eel then does it make the journey too? One may assume so but it would not return and who can say that its offspring in the Atlantic Ocean even go back to the same place? There have been purely speculative suggestions that such a large eel may have somehow become an indigenous breeder and indeed by doing so would extend its lifetime and possibly trigger increased growth. This sounds plausible but alas there is no reason to believe it. But a homebound eel would seem to be prerequisite amongst this unusual eel's adaptions. Well, they could if they were about 80 feet in length according to Gould. For an eel to protrude its upper body out of the water would help explain a proportion of this class of sighting. How the eel achieves it I am not sure and I could find no image of an eel doing it. Some adaptions to our Nessieel are required to achieve this. Perhaps an enhanced buoyancy mechanism which for some reason raises the eel more efficiently from its normal benthic domain. Apart from these, I would consider this the weakest part of the giant eel theory. As mentioned by Gould above, some hump sightings require a body much thicker than any known eel possesses. In response to this, Mackal suggested the thick-bodied eel which along with its dorsal fin could achieve this effect. Is such a scenario possible? Given the plausible stories we often hear about how one species evolves into another given enough time and resources, one would be tempted to say "yes". What the real world in reality produces is another matter entirely. However, I would not discount the giant eel theory on that basis. In this case, another tick box is required which is common to all Nessie theories and that is the "Credible" tick box. Apart from one theory, all proposed theories fail to tick all the boxes and fall short in at least one area. In that respect, the eel theory is not alone. But proponents of a given theory may tend to stretch things a bit as they try and make their theory accommodate the data (though the more common tactic these days is to discard inconvenient data). There is nothing wrong with that so long as they can make themselves sound reasonable and that is where the "Credible" tick box comes in. If a particular theory begins to make too many assumptions or even one assumption which is just too big a leap then the "Credible " box should not be ticked. Using the giant eel hypotheses as an example, should we tick that box? Personally and until something comes in to change that (that is, new data comes in or my lack of understanding of biology) I would tick the credibility box on giant eels though I would not commit myself quite yet to the theory. I was not so disposed to this theory until I saw the eel like head with open mouth in the Hugh Gray photograph which suggested a piscean explanation for the Loch Ness Monster. I flipped the Mackal eel head to match the Hugh Gray head for comparison. Note also that for a creature that inhabits darkness, smaller eyes would be expected which is what this picture suggests in contradistinction to the Mackal eel eyes. In summary, Nessie may be a giant eel but modifications are required to the morphology which could be attained given the large variety of morphologies we see in other orders of fish. But whether this is credible is largely down to the opinion of the reader. Comments are welcome! 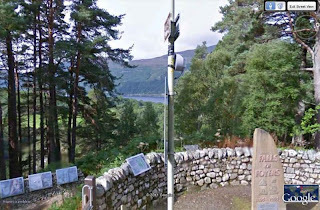 In an earlier post I relayed what was then the latest sighting of Nessie by the Hargreaves of Foyers back in June. The link is here. Subsequently, I have been to Loch Ness and visited their shop to have a chat with them about their experience. Firstly, they said the Inverness Courier article was an accurate enough account of what they had seen. I then asked them if there was a possibility it could have been a boat or some other familiar vessel seen on the loch to which they replied no. Both witnesses came across as people who thought they had genuinely seen something and were not practical jokers or liars. They also rejected with a sigh the accusations levelled at them by anonymous comments on the Courier website that it was the tourist season and so it was time to put out some lies to boost trade. I quite agree with them, it is a nonsensical and libellous thing to say and unfortunately whenever a sighting is claimed from March onwards, this tired excuse is wheeled out by cynical observers. However, I did buy some stuff in their store and before anyone plays that cynic card, I was intending to buy some food for the drive home and theirs was the most convenient place to stop! I then left the store and crossed the road to the Fall of Foyers milestone to have a look at the loch. The picture below is from Google StreetView but it underestimates what is visible from there to the unaided human eye. As stated before, there is plenty of surface area visible for Nessie to put in an appearance. From my vantage point, I could clearly watch one of the white Caley Cruiser boats travelling up the loch and I managed to photograph it as it disappeared into the trees. Assuming it was one of these boats then it would be 30 to 39 feet in length and 11 to 13 feet high. With those rough dimensions in mind, my own estimate of what I could easily see as a vertical neck like object would be at a minimum four feet. Below that may still be discernable but I do not have 20-20 vision even with glasses on, it depends on how good the observer's eyesight is. My visit therefore reinforced my view that what the Hargreaves saw back in June was no optical illusion or misperception but a genuine sight of the Loch Ness Monster. Keep up the appearances, Nessie old girl!